Dull with showers and some sun. This is the first of the second brood Small Tortoiseshell butterflies for this year. Marsh Woundwort - Stachys palustris - has opened on muddy areas around the patch. It hybridises with Hedge Woundwort and I'm sure I'll find some of the hybrid to show soon. 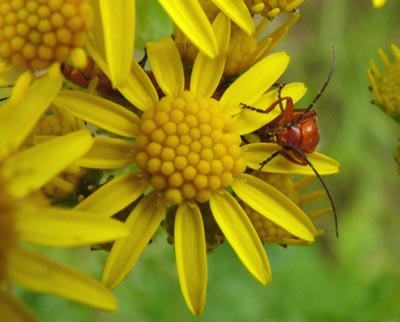 I rather like this picture of the Rhagonycha fulva just peeking up through the Ragwort petals. I watched this Tenthredo sp. 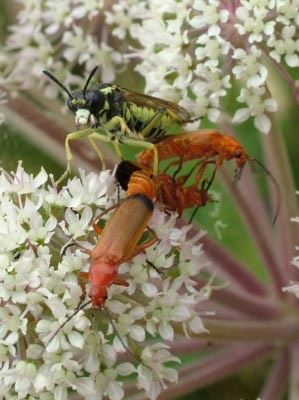 Sawfly nectaring on the Angelica. They are carnivorous, too, and this one pounced on one of the Rhagonychas in the second picture. It got forcefully repelled as you can see. At the instant the shot was taken, it was moving through the air without flying. 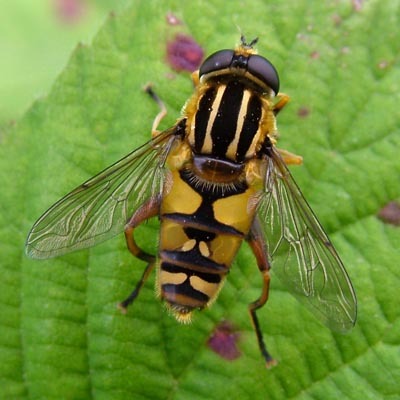 Here's a nice close-up of Helophilus pendulus - a hoverfly that has been unusually photogenic this year. This is Stenepteryx hirundinis - the Swallow Ked. It's a fly that is parasitic on Swallows and House Martins. I knocked down an abandoned nest and found three of these ugly creatures in the debris. About 6 mm long.